Linville Caverns is an active limestone cavern, with stalactites (hang down) and stalagmites (grow upwards) being created and growing today at the geologic pace of one cubic inch per 125 years. Linville Caverns is located in McDowell County on U.S. 221 N. about 19 miles north of Marion. The cavern was opened to the public in 1937. Local tour guides lead groups of 15 through the caverns for a 45-minute tour. Linville is not on the scale of Mammoth or even Luray Caverns in Virginia, but they are caverns and they are nearby, easily accessible and totally worth the price of admission. I feel obligated to add a little heads-up with that assertion. The guides have given names to many of the various rock formations in the caverns and part of their spiel is to point out the “alligator,” “George Washington,” the “slab of bacon” etc. But you also get a good dose of the history of the caverns plus the geologic formation and if you press them about the geology and/or the flora and fauna of the caverns they are quite knowledgeable. And yes, there is flora – it’s algae and it’s only there because of the artificial lighting. The caverns are a honeycomb of three levels. The bottom of the “bottomless lake” is the lower level and the middle layer is the tour path, while above are chambers with floors of flowstone – a glass-like limestone formation too fragile to stand on. 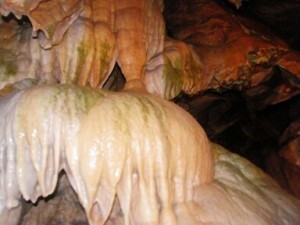 There are some really interesting stalactite and stalagmite formations and a few columns – where the two come together. One of the tales and experiences of the tour happens at the end of the tour path. The guide turns off the lights except for one small lantern and recounts how, in 1915, two teenage boys decided to explore the caverns with a lantern. The lantern holder tripped, dropping the lantern and it broke. The guide turns out the lantern and you are left in pitch black – can not see your hand six inches from your face. Thankfully, the boys found the stream and on their hands and knees crawled to the entrance. Supposedly it took them two days to navigate the 800 feet or so and they had to be treated for hypothermia, but both survived to tell about it. The caverns maintain a steady temperature of about 52 degrees Fahrenheit year round. This makes it ideal for a bat hibernaculum and hundreds of little brown and eastern pipistrelle bats spend their winters here. Regrettably, white-nose-syndrome, a fungus deadly to hibernating bats in North America has also found its way to the caverns. Tour participants are asked to disinfect the bottom of their shoes on a mat after experiencing the caverns. After our subterranean adventure we decided to try and touch the sun and headed to the highest peak east of the Mississippi – Mt. Mitchell, just a short drive down the Blue Ridge Parkway. Join us for our assault on Mt. Mitchell in next week’s Naturalist’s Corner.